In 2022, American Jews face an increasingly unsafe and anti-Semitic landscape at home. Against this backdrop, the Jacobson family gathers for Passover in Los Angeles. But their immediate problems are more personal than political, with the three adult children, Mo, Edith, and Jacob, in various states of crisis, the result, each claims, of a lifetime of mistreatment by their father, Julian. The siblings have begun to suspect that Julian is hastening their mother Roz's demise, and years of resentment boil over as they debate whether to go through with the real reason for their reunion: an ill-considered plot to end their father’s iron rule for good. That is, if they can put their bickering, grudges, festering relationships, and distrust of one another aside long enough to act. DAVID SAMUEL LEVINSON is the author of the novel, Antonia Lively Breaks the Silence, and the story collection, Most of Us Are Here Against Our Will. He has been nominated for the Pushcart Prize and has received fellowships from Yaddo, the Jentel Foundation, Ledig House, the Santa Fe Arts Institute, the Sewanee Writers' Conference, and the Marguerite and Lamar Smith Fellowship for Writers. He has also been published in The Atlantic, RE:AL, storySouth, The James White Review, The New Penguin Book of Gay Short Stories, The Brooklyn Review, Prairie Schooner, The Toronto Quarterly, West Branch, and Post Road, among others. He has formerly served as the Emerging Writer Lecturer at Gettysburg College and as the Fellow in Fiction at Emory University. "This frightening glimpse into a near future that has succumbed to hatred rings uncomfortably true with present-day circumstances in America, making it essential reading for our times. In Julian Jacobson, Levinson has crafted an unforgettable villain, whose family fights through the psychic woods of years of abuse and out into a clearing of sorts. Levinson skillfully deploys an unexpected twist that reveals new layers of psychological complexity and gives his narrative a satisfying shape. This is a dark book that casts a powerful light and earns every ounce of the pathos of its denouement." "Tell Me How This Ends Well is Cormac McCarthy's The Road doing 70mph in reverse on the 405. David Samuel Levinson's dystopian vision is deeply strange in the best way, perverse and precise and teeming with life, reminiscent of George Saunders, Flannery O'Connor, Nathanael West. A comic novel firing on all cylinders, with one eye on the highway and the other to our future." "Like absolutely nothing I've read before, Levinson's brilliantly unsettling, fiercely funny novel takes on both dangerous intolerance in the near-future world, and in the confines of one wildly destructive family, where ties tighten like nooses and kith and kin can become like warring political systems. Affecting and hilarious, and filled with dark truths that gleam like jewels. I totally loved it." 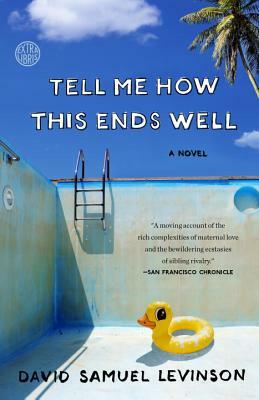 "Tell Me How This Ends Well is a wickedly funny, intelligent examination of the dynamics of a uniquely strange family, and David Levinson guides these characters through a plot that intensifies in such unexpected ways. Against a backdrop that feels both terrifying and yet utterly plausible, Levinson again and again finds ways to make the struggles of this clan explode with a kind of humor that most writers could not dream of pulling off. A daring, memorable novel." "David Samuel Levinson's Tell Me How This Ends Well is an absolute joyride through the dark, beautiful terrain of the near future. This is a book that is, arguably, about everything-- about family and love and hatred and politics and the indomitable self, and Levinson tackles the whole thing with abundant intelligence, seriousness and humor, and convinces, once again, of the novel's enduring power to grasp the future. Reading these pages is such a deep pleasure for the reader, to see these crystalline sentences pour forth, each one full of life and imagination. I loved this book, and will continue to read it." "Witty, acerbic, hilarious, terrifying, and true, David Samuel Levinson's Tell Me How This Ends Well is a treasure."